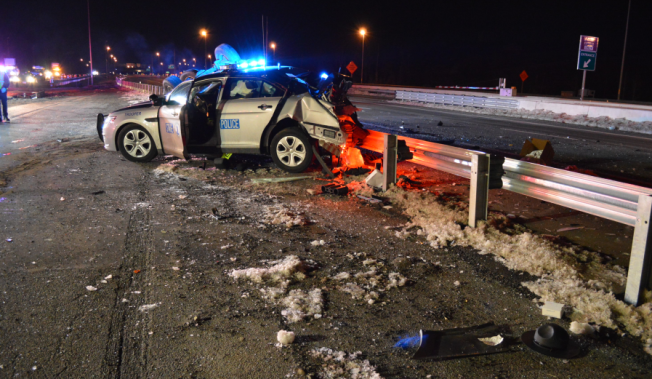 A Virginia State Police trooper is recovering after an SUV slammed into his cruiser in Prince William County early Tuesday morning. 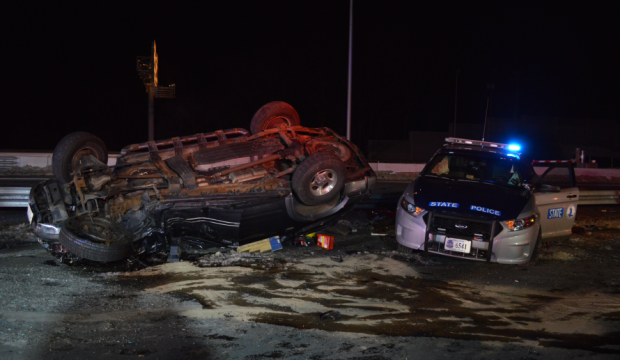 Police say the driver of a 2000 Ford Explorer was speeding in the southbound lanes of I-95 when he lost control near mile marker 152 at about 3:30 a.m. The SUV overturned, slid off the left side of the interstate and crashed into Trooper I.J. Dallam Sr.'s parked patrol car. Dallam was running stationary radar at the time of the crash. Dallam was transported to Sentara Prince William Hospital with serious injuries. He has since been treated and released. The driver of the SUV, 23-year-old Corey Saenz of Quantico, Virginia, suffered a minor back injury, but refused medical treatment. He has been charged with reckless driving. The force of the crash left the back half of the trooper's cruiser shredded. Dallam was parked off the left side of Interstate 95 (where the former HOV lanes used to merge into southbound I-95) and running stationary radar on southbound traffic.